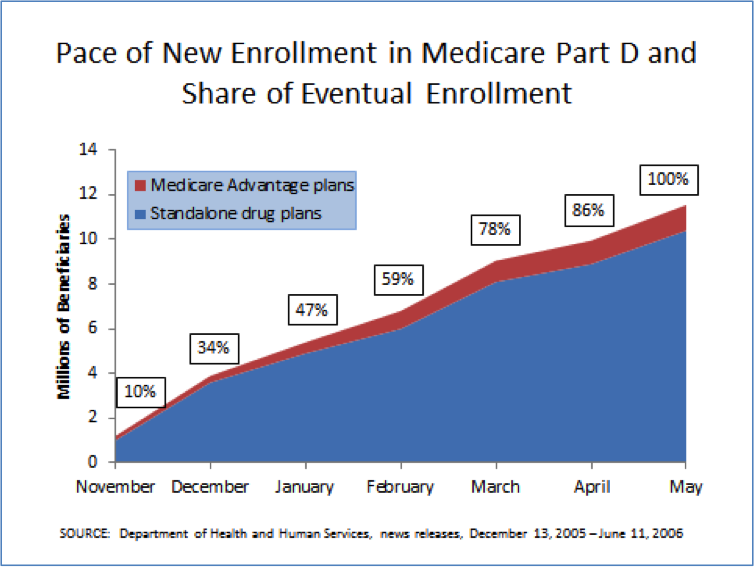 As we await the first set of marketplace enrollment numbers from HHS, we need to maintain perspective. The Medicare Part D experience tells us that enrolling for a new health benefit is not something you expect to do quickly. As of the equivalent first month report in the fall of 2005, 10 percent of those who would eventually enroll voluntarily in Part D had signed up. As I reported in a previous blog, only one in three had signed up in time to start benefits by the first of the year. And those numbers were accomplished in a program where the sign-up process, despite its own troubled start, functioned better than the Affordable Care Act’s marketplace enrollment process has so far this year. But perhaps more importantly, a decision to sign up in Part D was easier than the choices facing consumers today. Part D enrollment was not an easy decision for Medicare beneficiaries who had never before seen private insurance plans for drug coverage and struggled to understand tradeoffs among formularies, deductibles, cost sharing, and premiums. But today, consumers must also consider and choose among a much broader range of provider networks and cost sharing differences represented by the different plan metal levels. And they are doing so in an even more politicized environment. The enrollment numbers we see this week will probably seem very low. But there is precedent for low early numbers in Part D (as well as the Massachusetts exchange experience in 2007). The numbers that matter are how many people sign up by the end of the year and – even more important – how many people enroll by March 31, 2014, the end of open enrollment. We should not be surprised if Americans shop carefully and wisely. As the Commonwealth Fund reported recently, “a significant majority of those eligible say they’ll try out or return to marketplaces by the end of the enrollment period in March 2014.” Consumers are not rushing to judge their insurance options. We should not rush to judge the enrollment numbers. This entry was posted in Implementing the Affordable Care Act and tagged aca implementation, affordable care act, enrollment, health insurance marketplace, Medicare Part D, open enrollment by CHIR Faculty. Bookmark the permalink.